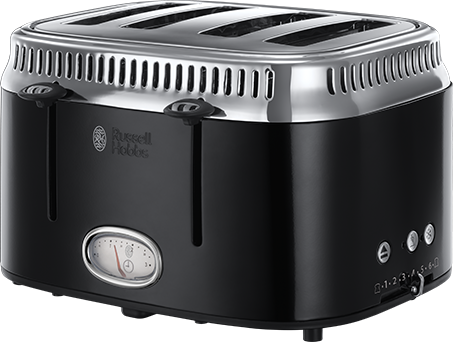 The stunning Russell Hobbs Retro Classic Noir is a kitchen essential for the coffee connoisseur. 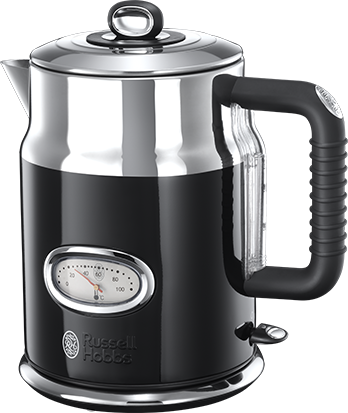 Its retro styling includes a host of advanced features designed to improve your coffee making experience and enhance the taste of the end result. This great coffee maker uses advanced showerhead technology during the brewing process for better extraction and improved coffee flavour*. The shower function efficiently sprays all of the coffee in the filter to ensure every grain is drenched and waste is reduced. Because more of the coffee is used, your freshly filtered coffee should taste even better. Whether you prefer intense or mild flavours, this advanced machine makes delicious coffee just how you like it. The keep warm feature means even your second or third cup will be as piping hot as the first. To help you get the measures right, it also has a handy one cup coffee scoop so you’ll only use the amount of coffee you need for the number of cups you’re making. The Retro Coffee Maker has a large and stylish Brewing Progress Coffee Gauge. It’s not just a charming design feature; it allows you to keep an eye on the brewing progress and the length of time the ‘keep warm’ feature has been active. A Pause and Pour feature will stop the brewing process if you want to pour your first cup while the rest of your coffee is still brewing.